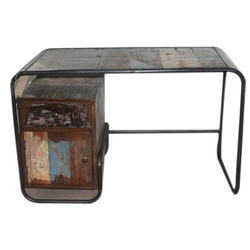 Offering you a complete choice of products which include wooden writing table and reclaimed wood writing desk. Fashioned perfectly, this splendid hand crafted writing table portrays your appreciation for Indian artistry. Furnished with multiple drawers, this table also provides space for storing writing materials. Available with upholstered chair, this wooden writing table will add new dimension to your ambiance. 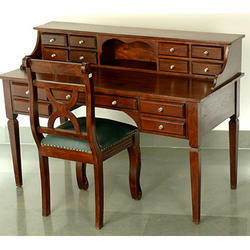 Owing to our extreme prowess in the domain, we are offering best quality Reclaimed Wood Writing Desk. Our professionals are uniquely skilled and leveraging rigorous R & D expertise to meet and exceed the clients’ challenging requirements for functionality and style. Ideal for tight spaces, modular rooms and loft style apartments the offered writing desk is best suited for long working hours. The rustic look and multicolored wood compliments the whole décor in the room and our quality compliant fabrication standards make it the valued addition to the industrial decor. Further, we are providing the exclusively designed range of industrial furniture at the best price in the marketplace.